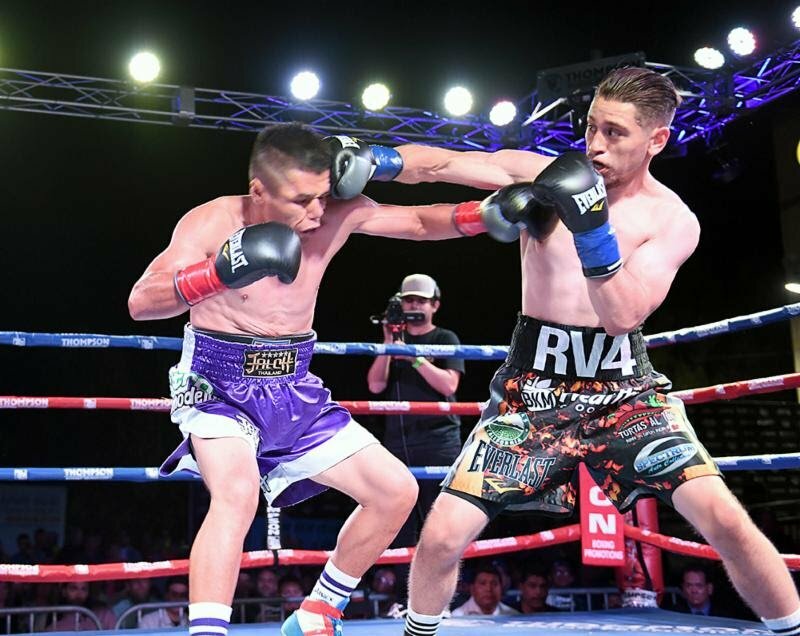 Ruben Villa (13-0, 5 KOs) continued his trend of routing opponents on the scorecards by thoroughly outpointing Jose Santos Gonzalez (23-7, 13 KOs) in Friday night’s “Locked n’ Loaded” main event. Villa used his signature quickness to batter Gonzalez throughout the 8-round fight. To watch a replay of the fight, please click here. The southpaw from Salinas, Calif. hammered Gonzalez with accurate jabs and punishing left hands. In nearly every round, Villa, 21, rocked Gonzalez on his heels with a variety of punches from all sorts of angles. Gonzalez, despite his experience in high profile fights, was unable to muster any kind of attack. He nearly went down in the fifth when Villa cracked him with a body shot. Scores: 80-72, 79-73 twice. Villa is promoted by Thompson Boxing and Banner Promotions. Budding bantamweight talent Saul Sanchez (10-0, 6 KOs) of Pacoima, Calif. showed off his superior finishing ability with an explosive fourth round knockout of veteran Ernesto Guerrero (28-23, 18 KOs) of Mexico. The “Locked n’ Loaded” co-feature was scheduled for 8-rounds, but Sanchez only needed half that time to look the part of an elite prospect. The payoff punch was a right hook to the body that sent Guerrero through the ropes. He was able to hold onto the bottom rope, otherwise he would have taken a nasty tumble outside the ring. Sanchez worked the body with both hands in the previous rounds and also landed plenty of left hooks upstairs. He jabbed to the body well and threw uppercuts to stop any kind of attack from the outmatched Guerrero. Sanchez essentially broke him down round by round until the final punch. Welterweight Luis Lopez (4-0, 3 KOs) of Corona, Calif. added another stoppage victory to his record by dispatching the overwhelmed Edgar Garcia (7-18-1, 2 KOs) of Mexico in the fourth round (:39). Lopez, who is trained by Henry Ramirez, jumped on Garcia early and often. He mainly relied on his power punching to back up the smaller Garcia. Lopez’s favorite combination was a lead left hook followed by a straight right. Once Lopez closed the gap, he would unload a series of punches that made Garcia cover up and throw defensive shots that rarely found their mark. Bantamweights Daniel Guzman (2-1-1, 1 KO) of Los Angeles and Luis Montellano (0-3-2) of Tijuana, Mex. fought to a split-decision draw, as neither boxer was able to put their stamp on the fight. The bout, which was tough to score due to the activity levels of both fighters, resulted in one judge scoring the four rounder for Montellano (39-37), another had it for Guzman (39-37), while the third was deadlocked at 38-38. Heavyweight Elvis Garcia (6-2, 5 KOs) of San Diego dominated Mexico’s Oswaldo Ortega (3-9, 1 KO) to the tune of a unanimous decision sweep (40-36 x3). Garcia wasted no time trying to feel out Ortega. He came forward throughout the four round fight and landed quality shots in every round. Lightweights Carlos Velazquez (1-0) and Keith Carson (0-1) made their professional debuts on the “Locked n’ Loaded” show opener. Velazquez, who lives in Phoenix but trains with Joel Diaz in Indio, Calif., took the four rounder by unanimous decision. Velazquez’s most impressive punch was a left hook that Carson repeatedly walked into. The fight featured some sloppy displays, but overall, Velazquez proved to be the more well-rounded prospect. Scores: 40-36 twice, 39-37.